I baked these a while ago, but I want to make more. 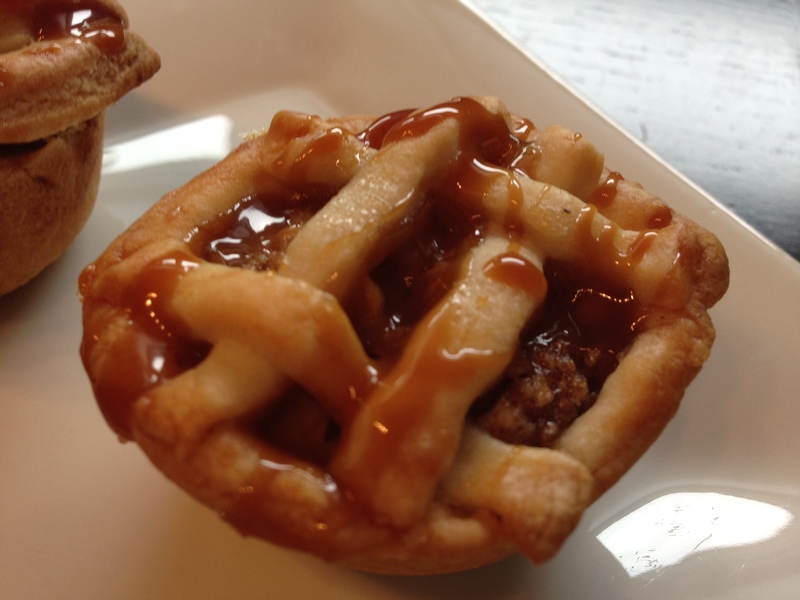 I just can’t get enough of these mini caramel apple pies. I find myself making these kind of “mini” desserts often. I think it’s because I find people are more willing to take a two bite mini pie than cut themselves a whole piece. Maybe it seems like less of a commitment? Trust me, if you make these, you won’t be taking any home at the end of the party. Pre-heat oven to 400 degrees. Start by taking a circle shaped cookie cutter (or a glass, like I used) and cut out the mini pie crusts. Put each circle into a mini muffin pan sprayed with non-stick cooking spray. In a big bowl, gently stir together the apples, sugars, flour, and spices. you want everything mixed, but you don’t want the apples to turn to mush. Spoon the apple mixture into the pie crusts, being careful to keep the juice you take along with the apples to the minimum. Now, it’s time to do the top of the pies. I did half my pies in a lattice and the other half in a vented whole top. My feedback told me that there was a slight preference for the lattice top. I think the ratio of filling to crust is better with a minimal time. I’d recommend doing a lattice or a cut out shape (apple, leaf, etc) on top. Once your pies are assembled, beat the egg with just a little bit of water to make an egg wash. Brush the tops of each pie with the wash. This will make the tops golden toasty and delicious. Finish each pie off with a sprinkle of turbinado sugar. Now, I was nervous that the filling would become so hot that it would bubble over the top of each pie, making an ugly mess. To combat this, I wrapped the mini cupcake pan in foil, and baked it for 10 minutes. Take the foil off, turn the pan, and bake for another 10 minutes. 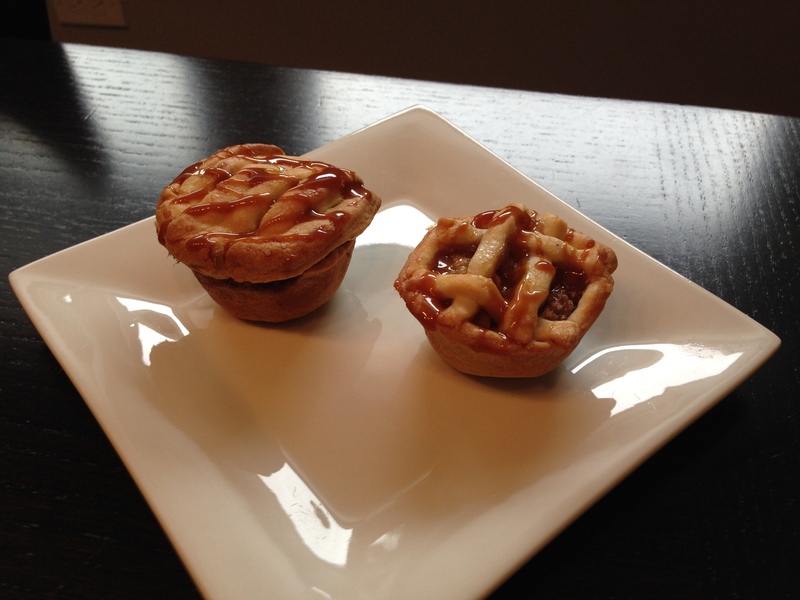 While the mini pies are still hot, drizzle the caramel over the top of each one. This gave the pies just a hint of caramel flavor. If you want a stronger flavor, I’d suggest adding the caramel to the apple mixture before putting the filling in each pie. Still add caramel on top at the end, for a pretty effect. I’m hoping to post some of the other fall desserts I’ll be making over the weekend, so check back soon for more sweet treats. Thanks, Mary! So glad you liked them!